240 flight attendants spent Thursday 7th - Sunday 10th May locked out from work across Auckland, Wellington and Christchurch. The attendants are contracted to Zeal 320, a shell company owned by Air New Zealand, and operate on trans-Tasman and Pacific routes for the airline. Despite doing the same job as flight attendants contracted directly to Air NZ, the Zeal crew are paid significantly less. The Engineering, Printing & Manufacturing Union (EPMU), which represents the workers, has been negotiating with Air NZ for months, but Air NZ have been unwilling to move towards pay parity for the Zeal staff. The Zeal staff have been engaging in low level industrial action since late March, including breaking the uniform policy and refusing to do paperwork (see Solidarity, Issue 2). The action was escalated with the announcement of four days of strike action for May 7th - 10th. Air NZ responded to the strike action by announcing the workers would be locked out for the same period. In the build-up to the lockout, at least 30 Zeal staff were suspended for breaking the uniform policy. These suspensions were short, only lasting until the next shift, as due to understaffing there would not have been enough people to replace any Zeal staff who were suspended for longer. An EPMU spokesperson mentioned that there had been some issues with pay resuming when the suspensions finished for some workers. 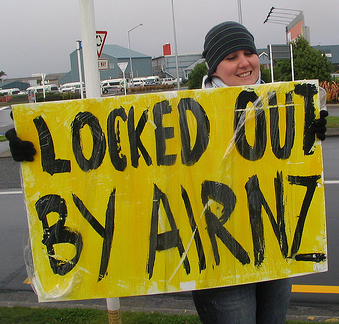 Across the four days of the lockout, Zeal workers and their supporters picketed at airports and Air NZ Holiday Shops in all three centres and the Air NZ headquarters in Auckland. In addition to the EPMU, members and staff from at least 8 other unions were present to show their solidarity. In speeches and on placards on the picket lines, many unionists spoke out against contracting through shell companies, as occurs with Air NZ and Zeal 320. While the Zeal staff are back at work, their fight for better wages and conditions continues. If Air NZ doesn’t come to the table with a better offer soon, further industrial action is a possibility. In the meantime, negotiations between Air NZ and the EPMU continue. The following interview with two locked out Zeal 320 workers was conducted in Wellington on the last day of the lockout, May 10th. Solidarity: What has been the build-up to this lockout? Zeal worker A: Over the last couple of months we’ve been having a few sit-downs with the company, basically trying to negotiate a fair contract and fair pay. Every time we’ve gone back to the table, the offers have been getting progressively worse. The last offer that they gave us was laughable. Zeal worker B: And it’s quite hard for us to accept that the company says we are earning between forty and sixty thousand dollars and that we’re now asking for seventy thousand. In all honesty, if this was the case, we would not be standing here. Zeal worker A: In fact, that’s a challenge - if you would like to pay us that amount of money, we’ll certainly sign on the dotted line, and we’ll sign today. For three years we’ve been putting up with terrible conditions, and the kind of contract that leaves us open to exploitation at every turn. Zeal worker B: We’re not asking to be paid any more than anyone else, we’re just asking for a fair pay for a fair day’s work. Zeal worker A: It’s about time they stopped treating us like second class citizens, because we’re part of Air New Zealand and they need to recognise that. We’re not some dirty secret that they can keep from the general public, it’s out there now, and we’re gonna be heard. Solidarity: Have you ever been on a picket before? How has it been? Zeal worker B: I’ve never been involved in a picket or a strike before … we’re all standing here because we know that what we’re asking for is only fair. We know that the New Zealand public would agree that we deserve to be treated fairly … and that’s why everyone has taken this stand against Air New Zealand. Zeal worker A: It’s worth it for us to be out here, and we will come out in the cold, and the rain, and nothing’s going to deter us, because, this is worth it for us, we’re gonna fight hard. We’re going to show the company that the little people have big voices, and we’re not going anywhere mate. This article and interview taken from Solidarity, free monthly newssheet of the Aotearoa Workers Solidarity Movement. You have to read it with a kiwi accent to gain the full experience of the interview. FYI - the fight is still ongoing, no agreement as yet. No sign of further strike action yet though. Great article, informative and well put together. Thanks very much, and good luck to them!